It might sound unappealing, but if you’re not familiar, cheese tea is an insanely delicious beverage that perfectly marries contrasting flavors. Served hot or iced, cheese tea consists of green or black tea topped with a luscious pillow of salted, sweet, whipped cream cheese. The drink has been super popular in China for several years but is just now starting to pop up in cafes and tea shops around the US. The key to properly enjoying cheese tea (IMO) is to not stir the cheese cream into the drink or use a straw, but to sip the cup at such an angle that you taste a little of each layer with every sip. The herbal flavors of the tea and the sweet, salty, creaminess of the cheese cream enhance one another and make for a wholly unique beverage experience. Add to this indulgent combination a beautifully crafted floral and fruit-forward gin, and you have a next level cheese tea cocktail! I chose Nolet’s Silver Gin for this purpose, a truly unique gin with an unusual blend of botanicals that includes peach, Turkish rose blossoms, and raspberries. 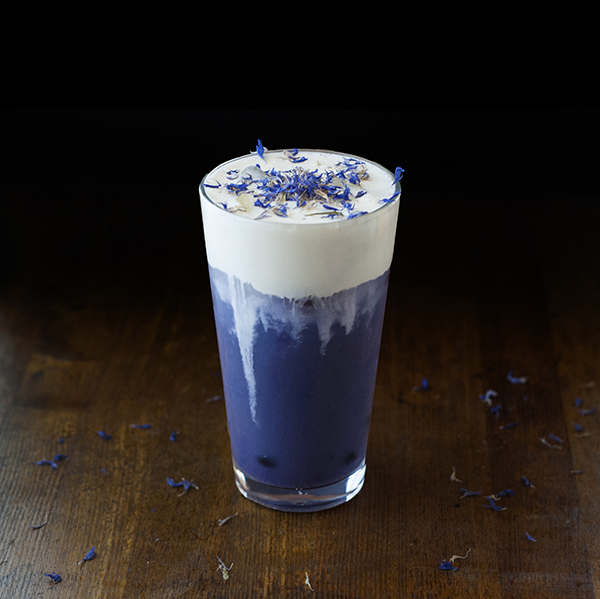 I have been experimenting quite a bit with the very popular butterfly pea tea over the past few months, but I’ve found it can be a little tricky to craft a really good cocktail that maintains the gorgeous blue color of the flower petals. When butterfly pea tea mixes with citrus juices, it turns a pink or purple color, and when mixed with anything that’s not quite clear, it tends to turn a murky brown color. 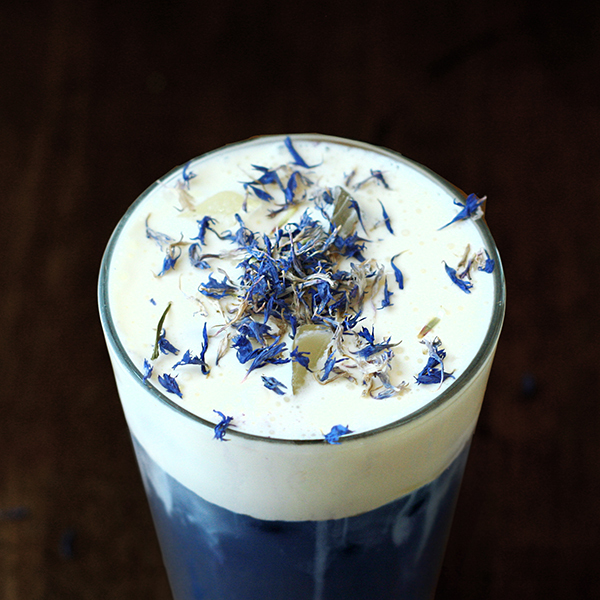 After much trial and error, I’ve created a recipe that I think works perfectly with butterfly pea tea, by combining the flowers with blueberries in a syrup. The result is a deep violet, deliciously fruity syrup that perfectly complements the fresh herbal flavor of green tea. I’ve yet to find any place serving cheese tea in New Hampshire, but I’m really enjoying making it at home. Have you tried cheese tea? What did you think? Add a handful of frozen blueberries to a tall glass (I used a pint glass) and fill with with ice. In a mixing glass, combine gin, green tea, syrup, almond milk, and ice, and stir until chilled. Strain into your glass of frozen blueberries and ice. Top with a few generous dollops of cheese cream and sprinkle cornflowers (or himalayan pink salt!) on top. Heat the water and sugar in a small saucepan over low heat until the sugar is dissolved. Add the blueberries and butterfly pea tea and stir to incorporate. Cook the mixture until the blueberries begin to break down and the mixture begins to thicken. Remove the syrup from the heat and allow to cool. Strain and enjoy. I made a batch this size so that it wouldn’t be too difficult to blend with a hand blender (and so that I would have plenty of leftovers). Cut the recipe in half for a smaller batch. Combine all ingredients in a small mixing bowl and blend with a hand blender until smooth. Keep in the refrigerator until ready to use. Disclosure: This post may contain affiliate links, which means I may receive a commission if you click a link and purchase something that I have recommended. While clicking these links won't cost you any extra money, they do help keep this site up and running.